After a disappointing defeat against ballydonoghue last Sunday the Asdee seniors got back to winning ways against Laune Rangers B on Saturday evening. Asdee were firing on all cylinders as they gave a heavy beating to the Mid-Kerry side in a game played in perfect condition s at JP O’ Sullivan Park, Killorglin. Eoin Kennedy opened the scoring with a point after 2 minutes. Owen Tydings added another on the 4th minute before Michael Been fisted the ball into the Laune Rangers net for the opening goal on 6 minutes. He then added another point on the 10th minute before the home side opened their account with a fine effort on the 13th minute. Eoin Kennedy pointed a free on the 17th minunte before Laune Range grabbed a goal after a superb move up the field on the 22nd minute. This closed the gap to1-04 to 1-01 in favour of the visitors. However, Asdee were very focused on the evening and immediately increaded their lead through point from Charlie Dalton and an Eoin Kennedy goal on the 24th minute. Darren Russell, Mike Breen and Eoin Kennedy all added great scores in the period that followed befor Killlorglin closed out the scoring with a point in the 30th minute. 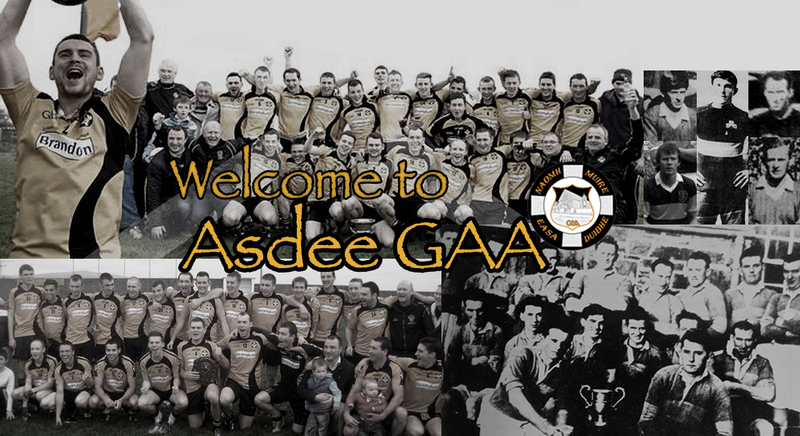 The Half-Time score saw Asdee lead 2-08 to 1-02 and there was never any doubt in the matter from then on. Laune Rangers opened the 2nd Half scoring in the 2 minute before Paul Carroll and Darren Russell added to Asdee lead with two points. The home side scored a point in the 5th minute before Asdee hit a purple patch with an Owen Tydings goal on the 8th minute followed by point sfrom Eoin Kennedy and Owen Tydings in between a Launre Rangers point. The home side added two further points before Michael Breen, John Doran and Eoin Kennedy hit the target in the 14th,15th and 16th minutes.